Cursed with a ravenous nighttime appetite, will John hurt the ones he loves? Sixteen-year-old John had a fight with his girlfriend, Andrea, at a school dance. After she stormed off, he started talking to Beth, the dark, disheveled, athletic new girl. One thing led to another, and they were kissing; then Beth bit him hard on the neck. After that, the dreams started. 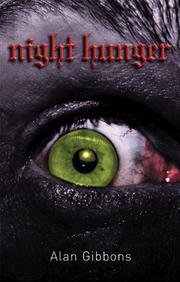 Dark, disturbing dreams accompanied by “night hunger.” John eats everything he can get his hands on at night. When the French teacher turns up horribly murdered in the woods, Beth is the only student not distressed. She starts stalking John, showing up at his house at odd hours. On the night of a party on the full moon, John and Beth both become monsters. Will he be able to protect Andrea and save the town from whatever Beth is…and whatever he has become? Prolific British children’s and YA author Gibbons’ entry in this high-interest, low-vocabulary series is a first-person tale told in simple, declarative sentences and a conversational style. A slick cover, short chapters and cliffhanger chapter endings make for a good Hi-Lo title, but not necessarily good fiction.